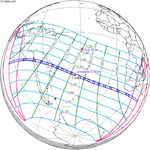 A total solar eclipse occurred on September 21, 1922. A solar eclipse occurs when the Moon passes between Earth and the Sun, thereby totally or partly obscuring the image of the Sun for a viewer on Earth. A total solar eclipse occurs when the Moon's apparent diameter is larger than the Sun's, blocking all direct sunlight, turning day into darkness. Totality occurs in a narrow path across Earth's surface, with the partial solar eclipse visible over a surrounding region thousands of kilometres wide. 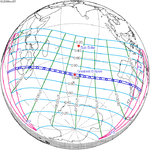 Totality started in Ethiopia, Italian Somaliland (today's Somalia), and passed British Maldives and Christmas Island in the Straits Settlements (now in Australia) in the Indian Ocean, and Australia. Two large scientific expeditions investigated Einstein's theory of relativity. ^ "1922 Solar Eclipse in Australia Testing Einstein's Theory". Retrieved 4 June 2011. 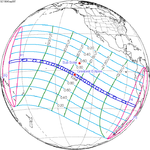 Wikimedia Commons has media related to Solar eclipse of 1922 September 21. This page was last edited on 22 September 2017, at 14:30 (UTC).